Fixed loot issues with relics and other items not being detected after 3.5/3.7 client update. Fixed some issues with ARM shutting down on start-up. I’ve been made aware about ARM no longer counting your AP relics when you loot them, due to a change in the log format since either 3.5 or 3.7, possibly also with other clients up to date like Russian or Japanese. I will post a fix for this tomorrow. 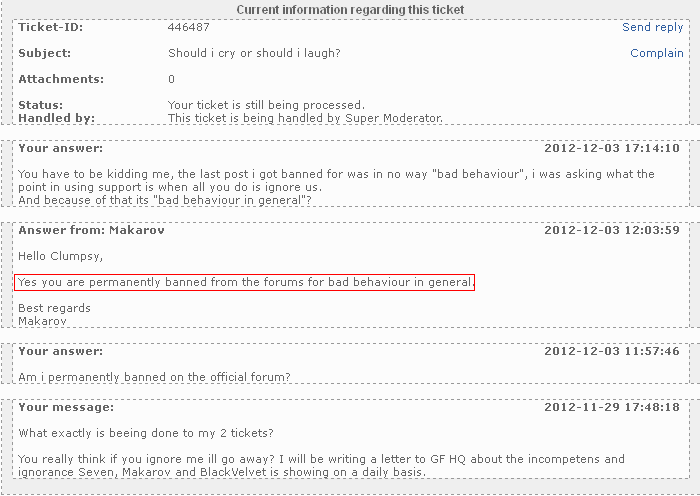 Player gets forum ban extended or permanent with any vague fake excuse, and their support area closed without further explanation, as well as threats of closing also their game account without any means to complain. Most often the mods themselves provoke the users with insults, just to make them talk back and have an excuse to ban them again, by breaking the rules the mod just broke themselves. The messages from the staff are unbelievable, you’d think they are either joking or not very bright in their head.. but that’s what we got. GF chiefs are aware of nearly all the negatives that have been voiced against them and have ordered the mods not to be so tolerant. The mods are not entirely to blame except Seven as we all know is by far the most active with bans. All bans do is make players more angry. I’ve told him just about everything that has been said here and that he wasn’t over popular but he said he knows about player frustration and he is only doing what he has been told. “torlling”, “troll baiting”, they sure sound like professional staff huh? What a freaking joke. If you wanna do your contribution to changing things for European Aion, I urge you to never buy anything from their shop again, as well as any items in-game coming from the shop (like Gold Packs sold by other users).